On 11 and 12 May 2016, the GREEN CYCLES symposium in Bangkok sought creative ideas for more sustainable production of textiles. It also launched the project series IKAT/eCut, with which the Goethe-Institut in Bangkok is illuminating the world of textiles as a symbol of both global shortcomings and social progress. Nana Brink of Deutschlandradio Kultur spoke with Marla Stukenberg, the director of the Goethe-Institut in Bangkok. Ms Stukenberg, at the latest since the disasters in the factories in Bangladesh, we tend to check the labels more often to see where the shirts we buy were made. Since then questions are being discussed far more often such as “Can textiles be produced sustainably?” or “Are there new approaches to improving working conditions in this textile industry?” What do you want to give participants to take away with them from the IKAT/eCut project? Marla Stukenberg | Photo: Goethe-Institut Bangkok The project series deals with various aspects of textiles. Thailand is in the middle of Southeast Asia, a region in which textiles play a hugely important role. Not only are textiles produced in many countries here, but we are also observing increased, rapid consumption of textiles in cosmopolitan cities like Bangkok and Jakarta as well as in Vietnam. This is where our project starts. We illuminate many aspects of the textile industry such as the role of textiles in crafts or in the design sector. But the aspect of sustainability is also one of our focal points: How can textiles be produced in a more resource-efficient way in future? And what role can future technologies play in that? 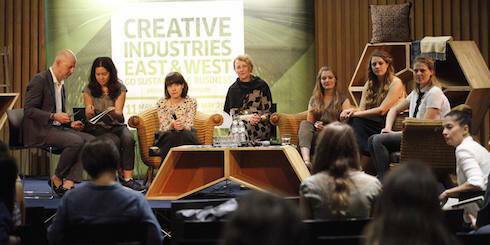 The project series was opened with the symposium “Green Cycles: Creative Industries East and West go Sustainable Business.” Who did you invite to the symposium? We invited a number of designers, business representatives and academics from the Hamburg University of Applied Sciences as well as participants from Germany, Malaysia, Thailand, Vietnam and Australia. They spent two days conferring in Bangkok. Some of these participants presented models that show how textile production chains can be positively influenced. When did you discover your own passion for textiles? I have lived in Asia for a long time – in Pakistan, India, Indonesia and now in Bangkok – textiles are literally ubiquitous here. Over time, I developed a passion for textiles and realized more and more what a role they play in the various cultures of Asia, for example in ceremonies or religious occasions. These textiles are also simply gorgeous to see. But at the same time, there is a growing awareness for the problems surrounding textile production. IKAT/eCut wants to sensitize the public on issues and problems relating to textiles. | Photo: Goethe-Institut Bangkok One merely need recall Bangladesh – the disastrous fires and the collapsed factory that caused the deaths of more than a thousand people make it impossible to evade the issue. With our event, we want to draw attention to the subject matter and heighten awareness for such processes. But isn’t there a problem that the event may only reach those who already have this awareness? How do you reach the actual target group, the black sheep of the industry? We are reaching a broader audience. In the media alone the subject is gaining attention simply because we launched the event. The participants of the symposium IKAT/eCut | Foto: Goethe-Institut Bangkok And, of course, we not only invited people who deal with ecological trends and issues, but others as well. We invited business representatives as well as young designers who deal with recycling and upcycling. We hope we can create a bridge between the two groups. The project is called IKAT/eCut. What does it mean? IKAT is the name of a traditional fabric originating in Asia that is given a pattern – called ikat – using a specific dyeing technique. The other term, eCut, stands for electronic cutting and indicates future technologies in textiles. The title therefore highlights an arc: We are dealing with textiles in crafts, design or sustainability, but also in connection with future technologies, so-called smart textiles, which are equipped with electronic devices or functions that are not visible from the outside. Transcription of a conversation between Marla Stukenberg and Nana Brink held on 11 May 2016 (Deutschlandradio Kultur).